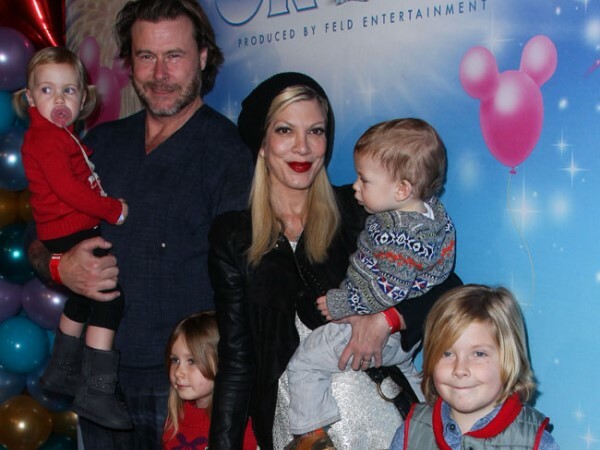 Tori Spelling's husband Dean McDermott has checked into rehab to address some health personal issues. Tori Spelling's husband has checked into rehab. Dean McDermott, who has four children, Liam (6), Stella (5), Hattie (2), and 15-month-old Finn with the former Beverly Hills 90210 actress, confirmed he is seeking treatment to address some personal issues, just one month after he was accused of having an affair with a woman at a hotel in Toronto, Canada. The Chopped Canada host told People.com: "I am truly sorry for the mistakes I have made and for the pain I've caused my family. "I take full responsibility for my actions and have voluntarily checked myself into a treatment centre to address some health and personal issues. I am grateful to be getting the help I need so I can become the husband and father my family deserves." The 47 year old is receiving intense treatment but is allowed to leave the facility to visit his children at home in Los Angeles. A source close to the couple said: "Their priority right now is their children." Along with infidelity rumours, Tori and Dean, who were married in 2006, have been rocked by financial troubles recently, and the 40-year-old actress is said to be privately "devastated." An insider previously said: "I don't think she even knows what she's going to do right now. But no matter what, she's staying strong for her kids. She's all about her family. She worships those kids. "I don't know if she's strong enough to leave him right now with everything she's going through and four young kids. She could stay with him or not. God only knows."